Far too many guitars have passed through my hands. I could measure my life in terms of Gibsons and Guilds, Martins and Fenders, crippling hire purchase agreements (Guild 12 string), shocking maxxing out of credit cards (Gibson J40), and the selling of everything else for the sake of one instrument (black Martin J40MBK). Time was I'd hang out in music shops for hours on end, endlessly strumming and picking, comparing and contrasting. I was a total guitar snob. And, I think, trying desperately to gain some kind of security in my very limited playing from possession of a good guitar: It gave you some kind of status, even if only initially. Lately, though, I've sold the hand-made Moon, keeping the Martin Shenandoah Susan gave me for home use and giving the last roadgoing Martin (not the black one; it's long gone)to James for his 18th birthday. As for performing (still doing it, I'm afraid: gigs coming up are Belladrum, Wizard and Wigtown festivals) I've acquired a couple of Chinese-made acoustics. Labelled Guvnor, they're examples of a phenomenon prevalent on eBay: a UK/US designer comes up with an idea for a product, and gets a Chinese factory to make it at a fraction of the price it would cost anywhere else. Depending on the baseline cost, the factory's capabilities, skill of craftspeople, quality of materials and obviously the original design, the results can be excellent, or terrible. The Guvnors I have are very good. Not all carrying that label are. What I have are designs by a British luthier known as 'Marc Lamaq' though I think his original name is Hammick. His career, if you do a bit of Google digging, appears to have had its ups and downs. The guitars are, to put it mildly, heavily influenced by the designs of Northern Irish legend George Lowden (pinless bridge, split bridge insert)but the quality of (all solid) woods used is fantastic. I have one (GA777CE)cutaway acoustic with a rosewood body, the other is maple (GA700CE). The rosewood one has one of the nicest bookmatched spruce tops I've ever seen. Both come with Fishman Classic Four electronics. They were less than £200 each. If there's an issue with either, it's in the neck area. Both necks are Gibson pattern, meaning thick and lumpy. I have large hands, so that doesn't bother me. The frets are jumbo sized and probably need dressed. But at least they're not lifting, as was the case with that hugely expensive black Martin J40. Which I sold, in the end, after smashing the front accidentally, with another Martin's headstock. Let's not talk about that. Now, the black Martin mentioned above cost around two grand, and that was 20 years ago, with basic Fishman electronics and a hard case. Are the two Guvnors as good? No. That black Martin, when new, had more, and more even, projection than any other guitar I've played. The neck, lifting frets notwithstanding, was a joy. But what a price. My two Chinese guitars are more than capable of handling professional work over a long period of time. The rosewood one in particular has the depth and aggression I look for in an acoustic. And the split bridge means the intonation is perfect. Really, no-one should be surprised. The tradition of quality instrument making in China goes back thousands of years. In the classical world, this has been long recognised. And if you're looking for a violin, cello or double bass bow, the carbon-fibre examples made in China are among the best anywhere. They're not cheap, though. Guvnor Guitars have a website, but I don't think they're trading except through Chase Direct in Manchester and the electronics in those guitars do not appear to be Fishman. You can track down the originals, and occasional Lamaq prototypes, on eBay, however. The "consultants' choice" eh? That apostrophe is key. Do they mean ALL consultants? In which case, that is a clear breach of advertising standards. SOME consultants, maybe. Oh no, wait a minute. 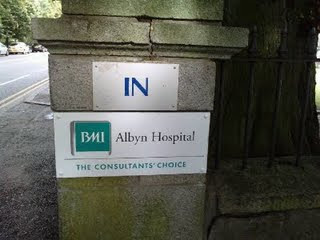 Maybe they don't mean medical consultants. Maybe they mean the kind of consultants organisations hire at a cost of X-thousand quid a day to summarise Wikipedia entries and put them in PowerPoint presentations. And so, after four hours on the train from Wick, I have reached Inverness. I have an hour here before the next train to Aberdeen, so I am now ensconced in an old haunt, the glorious foyer lounge of the Royal Highland (formerly Station) Hotel. Here you can hide behind giant plants, flop into comfortable couches and gaze at the sweeping staircase and old oil paintings, while a moulting stag's head gazes down at you. It has always been my favourite Inverness retreat. More so before its (quite careful) modernisation. I remember being here after my operation at Raigmore for skin cancer; here for numerous coffees, drinks and nefarious plotting with producers now scattered to the four winds of broadcasting and various corners of the world; the special 'Highland resident rate' for accommodation, a hangover from the British Rail days. And long before that, long lunches with my colleagues in Highland hackdom when I was working with The Scotsman. And briefer, noisier ones with the bairns when they were even more disruptive than they are now. Only much smaller. Anyway. The four hour trundle down from Wick represents a return to Victorian travel values in a very real sense. The Duke of Sutherland planned and partially built the line, and some of it, infamously, loops inland around his various hunting lodges. It was just as spectacularly scenic as I remember, if you like the alien, treeless vistas of the Flow Country, which I do. Met friends last night for dinner at the (relatively) new Malmaison in Aberdeen. It's the old Queen's Hotel, or rather the granite facade of the old Queen's. Inside, though, it appears that the interior designer concerned has been subject to hallucinations of the most debilitating kind. I have been in hotels from LA to Wick and Le Byblos to La Mirage (Helmsdale's finest establishment). 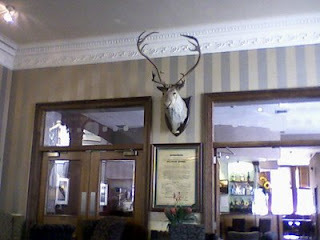 I have never seen anything quite so eye-poppingly, tartan-tattily awful as the inside of the Aberdeen Mal. Public areas, of course. Though you can stay there for £80 a night at the weekends, neither I nor the Beeb can afford its typically Aberdonian, utterly monstrous midweek rates. In truth the bar's OK, if you like acid-trip Brigadoon style, though the spotlit, dead bagpipes in reception are somehow... evil. The brasserie, though: A horrendous clash of styles between raw industrial Blade Runner pipework, kitsch animal pictures and gigantic hielan' coo blow-ups, matched with a see-through floor at the entrance (private tasting room downstairs; God help you if you're wearing a kilt) and a glass wall to the meat storage room, in which raw carcases loom like a veggie nightmare or Rembrandt at his coarsest. A nod to Damian Hirst, perhaps, but without DH's phenomenal grasp of integration. Apart from that, and some carelessly snobby, over-vicious service (we paid for that bread, LEAVE IT ON THE TABLE) and a sommelier who INSISTED on filling our glasses, until he was forcibly stopped, the food bit was really good. Great butternut squash soup, and loads of it. Fine bread, an exceptional shin of beef, and a good serving of cheese. Could have done without an extra £2.95 for each portion of veg, but the table d' hote is good value. My seat was too low, The 10 per cent service charge is an imposition and the music was bad and way too loud. Apart from that, I think a good time was had by all. But as for the decor. Rip it out and start again. Or have a look at the Leith and Glasgow Mals and, uh, have a wee rethink. 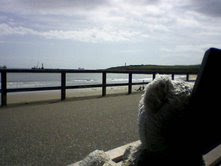 To the Santa Monica/Venice boardwalk of Scotland, for breakfast at the Washington Cafe in bright sunshine as surfers attempt to surf, joggers jog, swimmers shriek with agony at the cold of the North Sea, and The Loneliest Teddy Bear In The World gazes mournfully out to sea. Ah yes, Aberdeen in summer. Hate that twistgrip derailleur, too. And Dr Yan Lyansky's design is OK, but the vicissitudes of Scottish rain (the bike was kept for a month or two outside at Pacific Quay in Glasgow)has left it unexpectedly brown-stained over the white paint. Also, I have to say that I had the embarrassing experience of taking the front wheel to the Shetland Bike Project to get a burst tube fixed. or in fact replaced, as I'd fitted a 1.75 tube, not the 1.5 it needed. Thing is, nothing I did could get that tyre off. Must be age. Or bad resin tyre levers. Anyway, it's back in the camper now as I have to fly to Wick tomorrow. All will be explained. 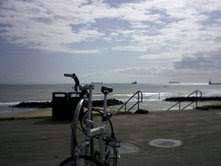 I did the ride alone, though James would have come with me. I wanted to find out if (a) I would die, or (b) have to stop, embarrassingly exhausted. Neither happened. It was painful, but generally good. And the aftermath, as ever, all cups of tea and the sense of having worked off that over-indulgence in curry, feels great. It's like drinking in reverse. You get the painful hangover first, then the relaxing glow. My Brooks B17 is, oddly enough, 17 years old. It was bought for my first Orbit, a glorious Reynolds 531 ST tourer, a Gold Medal Alivio. I still have that particular velocipede, all hand-brazed, double-butted, entirely Sheffield made, lugged to within in inch of its super-comfortable life. The finish on the original bike was appalling, the paint flaking off at the slightest impact. It's been resprayed in satin black and looks a treat. It hasn't been ridden for three or four years. This is the perfect saddle. Perfect for me, that is. The most comfortable seat a man could have. What nobody understands, it seems, about bike saddles is that they should be slippy. Those sticky gel things are a nightmare of chafing over a long distance. The worn smoothness of the Brooks, coupled with its gradual moulding to my exact, ah, proportions, makes it as much a of a joy as an overweight, unfit bottom can have aboard a bike. I think it was Camy or Kev, regular listeners both, who mentioned that Springsteen's My Lucky Day, from his most recent album Working on a Dream, was reminiscent of...something else. I'd been thinking the same thing for weeks. And tonight, after a bit of trawling through Google and YouTube (I could hear those words, 'in the midnight, moonlight hour') I found it. Except Here Comes My Baby is twenty times the song My Lucky Day is. It has, for example, not just a proper chorus, but one that soars and develops through three separate sections. It's a genuinely joyful, pop classic. Springsteen just repeats (and repeats and repeats) the same seven-note riff that comprises Here Comes My Baby's first line. Cat Stevens, AKA Yusuf, AKA Yusuf Islam is, without doubt, one of the great pop songwriters. Matthew and Son, here Comes My Baby, Father and Son, Moonshadow, Bitterblue and if nothing else, The First Cut Is the Deepest. Springsteen, an avowed fan of the British beat boom, would most certainly have known the Tremeloes version of Here Comes My Baby, maybe even have performed it. Any bootlegs out there? Anyway, compare and contrast. The studio footage, where Springsteen asks for 'a retro feel', is particularly revealing. Thanks to Andrew McConnel for pointing me in this direction. Here's my newly-acquired Talbot Express Sheldon camper conversion, bought off eBay and collected over the weekend in my first ever two-nights-on-the-ferry-in-succession Lerwick-Aberdeen-Lerwick dash. I know, I know. Not a VW. But for a VW, even a T25, in this kind of condition (rebuilt, resprayed, cared and cossetted) you'd be paying at least twice what I shelled out for this. No anthropomorphism. No names. Well, OK, the Pug, then, as it has that kind of look about it. And despite it being a Talbot, the last owner carefully sourced and applied a Peugeot badge to the front. It being, he says a Talbot-Peugeot. We're planning a wee trip to Uists in August, and some gadding about Shetland before that. As for those Grateful Dead stickers....they add a certain sort of Electric Kool Aid Acid Test vibe, don't they? Comes of listening to American Beauty last night.